A few hours earlier, Washington added Maduro to a steadily growing list of high-ranking Venezuelan officials targeted by financial sanctions, escalating a tactic that has so far failed to alter his socialist government’s behavior. For now, the Trump administration did not deliver on threats to sanction Venezuela’s oil industry, which could undermine Maduro’s government but raise U.S. gas prices and deepen the humanitarian crisis here. The sanctions came after electoral authorities said more than 8 million people voted Sunday to create a constitutional assembly endowing Maduro’s ruling party with virtually unlimited powers – a turnout doubted by independent analysts while the election was labeled illegitimate by leaders across the Americans and Europe. Venezuela’s National Electoral Council said turnout in Sunday’s vote was 41.53 percent, or 8,089,320 people. The result would mean the ruling party won more support than it had in any national election since 2013, despite a cratering economy, spiraling inflation, shortages of medicine and malnutrition. Opinion polls had said some 85 percent of Venezuelans disapproved of the constitutional assembly and similar numbers disapproved of Maduro’s overall performance. Opposition leaders estimated the real turnout at less than half the government’s claim in a vote watched by government-allied observers but no internationally recognized poll monitors. An exit poll based on surveys from 110 voting centers by New York investment bank Torino Capital and a Venezuela public opinion company estimated 3.6 million people voted, or about 18.5 percent of registered voters. The electoral council’s vote counts in the past had been seen as reliable and generally accurate, but the widely mocked announcement appeared certain to escalate the polarization and political conflict paralyzing the country. “If it wasn’t a tragedy … if it didn’t mean more crisis, the electoral council’s number would almost make you laugh,” opposition leader Freddy Guevara said on Twitter. Maduro has threatened that one of the constitutional assembly’s first acts would be jailing Guevara for inciting violence. The constituent assembly will have the task of rewriting the country’s constitution and will have powers above and beyond other state institutions, including the opposition-controlled congress. Maduro has said the new assembly will begin to govern within a week. Among other measures, he said he would use the assembly’s powers to bar opposition candidates from running in gubernatorial elections in December unless they sit with his party to negotiate an end to hostilities that have generated four months of protests that have killed at least 120 and wounded nearly 2,000. Along with the U.S., the European Union and nations including Argentina, Canada, Colombia, Mexico, Panama, Paraguay, Spain and Britain criticized Sunday’s vote. Maduro said he had received congratulations from the governments of Cuba, Bolivia and Nicaragua, among others. The monetary impact of the new U.S. sanctions wasn’t immediately clear as Maduro’s holdings in U.S. jurisdictions, if he has any, weren’t publicized. However, imposing sanctions on a head of state is rare and can be symbolically powerful, leading other countries to similarly shun such a leader. For example, the U.S. has had sanctions against Syria’s President Bashar Assad since 2011. Other heads of state currently subject to U.S. sanctions include Zimbabwe’s Robert Mugabe and North Korea’s Kim Jong Un. 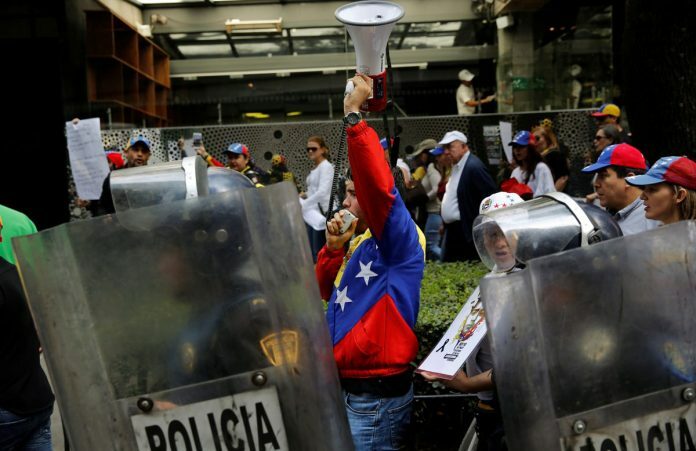 Maduro called the constitutional assembly in May after a month of protests against his government, which has overseen Venezuela’s descent into a devastating crisis during its four years in power. Due to plunging oil prices and widespread corruption and mismanagement, Venezuela’s inflation and homicide rates are among the world’s highest, and widespread shortages of food and medicine have citizens dying of preventable illnesses and rooting through trash to feed themselves. The president of the opposition-led National Assembly, Julio Borges, told Venezuelan news channel Globovision on Monday that Maduro’s foes would continue protesting until they won free elections and a change of government.